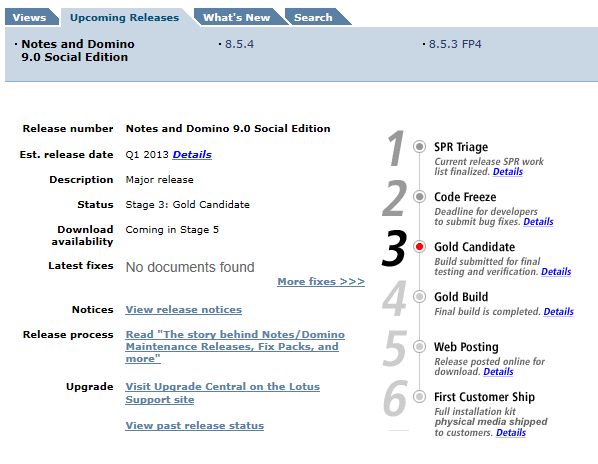 IBM Notes/Domino growing in Asia? Judging from an unscientific survey of postings in the IBM developerWorks forums, and also in the Lotus/Domino related forums on LinkedIn, the adoption of IBM Notes and Domino seems to have increased dramatically in Asia during the last few years. The growth seems to be mainly in India, with China coming in at number two, while Notes jobs in the US seems to be dropping or being stagnant. The indications that they are new or recent adopters are very strong. Many of the questions are very basic in their scope and it is obvious (and sometimes directly admitted) that a number of the posters are new to the Notes/Domino platform. Also, there is a big interest on LinkedIn for certification, there are frequent requests for the answers to the certifications tests, mostly from people located in Asia. It also seems like IBM is pushing Notes harder in the Asian markets, as I even seen IBM employees in that region asking for the test answers. A developer who does not know what replication conflicts are. When redesigning my website to use Bootstrap, I ran into a problem. The navbar (meny) did not render correctly in Internet Explorer 9, despite looking perfect in Firefox and Internet Explorer 10. There are several discussions about this problem on StackOverflow and other forums, and the solution is simply to add <!DOCTYPE HTML> on the first line of the HTML code. However, IBM Domino automatically adds a different doctype string, and there is no database or form property to change/set the correct value. But there is actually a way, and it is not very complicated. This way to modify the HTML generated is documented in the online help. It was added in Domino 8. A few days ago, a question was asked on StackOverflow about how to export the content of a Notes view to Excel. The caveat was that some columns contained multiple values, but not on all documents. To solve this, I wrote a Lotusscript class that will export view data as either CSV or as an HTML table, both can then be saved to a file and opened in Excel. I am posting the code below. Enjoy! Description: Code to export a specified view as CSV. the Apache Licence Version 2.
into a list of RowData objects. MsgBox "Could not open " + database + " on " + server,16,"Error"
MsgBox "Could not access view " + viewname + ". ",16,"Error"
rowarray(cnt) = "<tr>" + textrow + "</tr>"
And I am up and running! Downloaded the Notes client with Domino Designer and Administrator, installed it on top of the public beta from December in a viritual machine (with 1GB memory). Install went without any problems, and the client starts up fine. All settings and bookmarks were preserved from the beta. 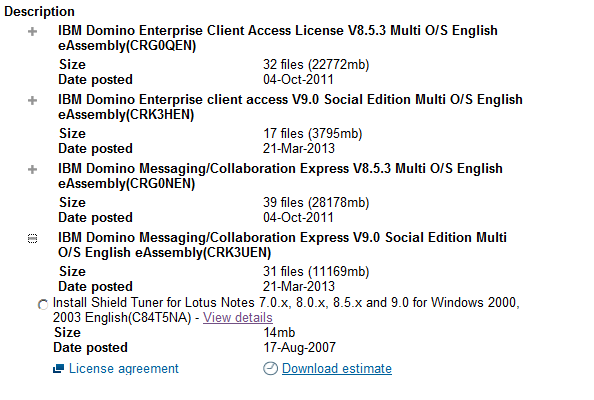 When I woke up this morning, I could finally start downloading the release of IBM Notes and Domino 9.0 Social Edition. And the filenames is actually (mostly) descriptive! I thought I would download IBM Notes/Domino 9.0 overnight, but after I logged in to Passport Advantage and went to the downloads, I can see that the files have (supposedly) been uploaded, but they are not available to select. If I expand the previous version, all the files for that version shows up… Hopefully IBM have this sorted out in the morning. Scott? A while back I created a little tool for my own use, to keep track of my Notes templates and their version numbers. I also developed a tracking database where we track not only changes to Notes applications, but also other changes to our environment. Things like modifications to Domino Directory and Active Directory, as well as other meta data changes, configuration changes, etc. After you download the template, use it to create a new Database. In the new database, open the Applications Settings document and enter the application name (should be “Change Tracking”). 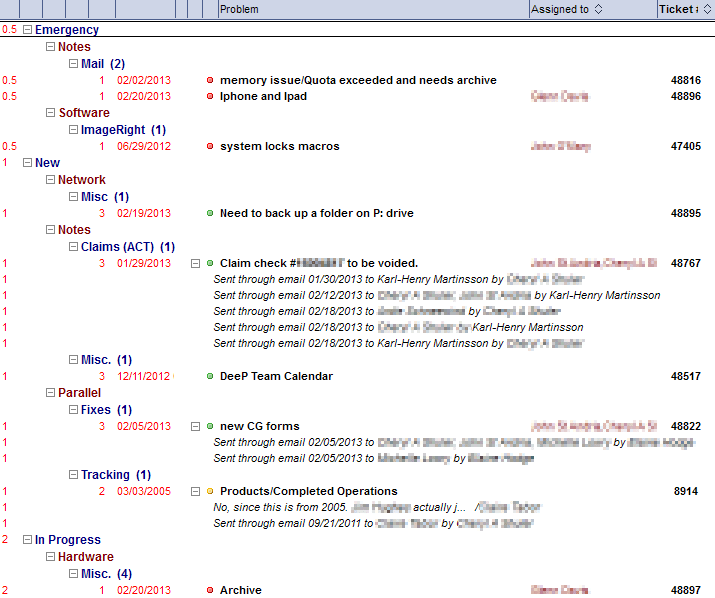 Also modify the list of systems, this is where the dropdown box in the actual form get its categories from. The only required is one called “System (IBM/Lotus)”, but I also suggest to create one called “System (your company name)”. 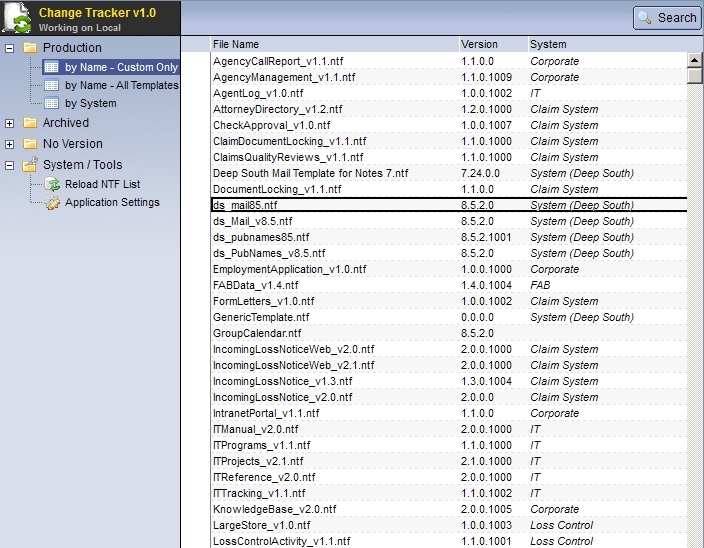 You can see an example of the configuration document below. You can now go ahead and load the list of local Notes templates. This is done in the System/Tools section as well. The next step is to open all templates not containing a version field and update them. Go to the section called “No Version” and open the view, then open each template and select the correct system and enter the application name. Then create the version field using the Template action menu, where you find the action ‘Create VersionField’. Enter your initial version number (major, minor, release and build), then save the template document. Now when you have all your templates updated with version numbers, you can start tracking changes using the “Add New Entry” button. Hopefully the application is fairly self-explanatory. The template is using ODS 51, so you need Notes 8.5 or higher to open it. There is also one known issue that I haven’t had time to fix yet. If you have the setting “Auto-increase build when adding entry” to “Yes”, you have to close and reopen the template document to see the new entry. If it is set to “No”, it shows up immediately. If anyone fixes this, let me know and I will update the template on my side too. Update: I have fixed the issue. It was as easy as removing the line uidoc.EditMode = False in the ‘Add New Entry’ action on the ‘Template’ form. The download has been updated. Update 2: I have also modified the template to use DateTime fields in a few places where I used regular text fields. Thanks Kenneth for pointing that out! Welcome to the third part of this series of articles about how to write better code for the Notes/Domino platform. In part 1 I wrote about creating your forms in a way so you get an instant idea of how they work (what is hidden, computed-for-display fields, etc) and in part 2 the subject had moved to Lotusscript, more specifically variable names and comments. As already mentioned in that last article (as well as in some of the comments), breaking out code into functions is a great way to make code easier to read as well as dramatically easier to maintain. That is what I will focus on in this article. You can have any number of arguments, from none to many. However, it is often suggested to keep the number of arguments to a minimum. I try to not use more than three arguments, unless there is no way around it. If you need to send a lot of information into a function, use an array or a custom data type instead. Then it is easier to change the arguments later, without changing the signature of the function. I have occasionally seen that cause issues in nested script libraries. Also, with many arguments the function declaration will probably not fit on your screen, unless you wrap the line. I try to always keep code visible in the editor, as it is easy to miss things when you have to scroll sideways to view code. So let’s take a look at one of the code samples in my last article, the one where we call names.nsf to get the email address for the current user. Let’s make this a function (like Kenneth Axi suggests in his comment), but we will make it a more generic function, returning the email address for any user present in address book, not just current user. Below is how I would write the function. We will talk more about error handling later, but you want to make sure to always check return values before you use them. The function takes one argument, the name of the user we want the email address for, and returns the email address, or blank if no user/address was found. The username must be in the same format as the names are being displayed in the view we doing the lookup in. MsgBox "Username is empty. Exiting. ",,"No Value"
'*** Create NotesName object and get CommonName part. '*** We do this so username argument can be in any format. MsgBox "Could not open names.nsf. Exiting. ",,"Error"
MsgBox "Could not find view 'PeopleByFirstName'. Exiting. ",,"Error"
You may wonder why I am creating a NotesName object and not just using the name passed as argument directly? That will allow me to get the Common Name of the name, no matter in what format it is passed. You should always check the values of any arguments passed to your functions to make sure you can handle them and that they contain valid data. In this case I make sure the username is not empty, but for a string containing a date I would use the IsDate() function to test that the value is a valid date-time. This brings us to the naming convention for functions. For functions, I use CamelCase, as that makes it much easier to see what the function does. I have to admit, I am not always consistent with get and set, I sometimes capitalize the first letter, sometimes not. Using CamelCase for functions and lowercase for variables makes it easier for me to read my code later, but you should do what you are comfortable with, and what works for you. The actual name of the function should describe what it does, without being too long or too short. A well named function will by itself document what it does when you see it in your code later. The function we just created above could have been called getEmail() or getEmailAddressForUserFromCentralServer(). The first is a little too short — you don’t know if it is getting a mail address or an actual email document– while the second is too long. I group functions into separate script libraries, making it easy to copy just certain functionality to a new application. There are many ways to name your script libraries, and I know some developers who use very complicated elaborate naming systems, where they can see at a glance if the script library uses back-end or front-end functions/classes, etc. I prefer a slightly simpler approach. So let’s look at a real life code example, from one of my production applications. This is an agent, called from a browser, that generates some charts and other information, based on the URL parameters passed to the agent. Thanks to the descriptive function names, hardly any comments are needed. The only comment in this code segment clarifies why we are doing what we do. Obviously the code is much more complex than what you see above, but it will give you an idea of how you can make your code easy to review and maintain. In the next article I will talk about classes and object oriented Lotusscript. We already talked about how to make your forms and views easier to maintain. But in most Notes/Domino applications, a majority of the code is written in Lotusscript (at least for traditional applications, XPages are outside the scope of this discussion for now). It is not hard to write easy to read Lotusscript code. Just follow some simple rules. As always, there are more than one way to do things, but this is how I do it (most of the time). I found that this works for me. Always use Option Declare (or Option Explicit) in all your code. This will prevent you from getting errors later when (not if!) you spell a variable wrong. Option Declare forces you to declare all variables before you use them. It also helps you by warning if a function or method is called with a variable of the wrong data type. Most of your bugs can be avoided using Option Declare. Use it! Give your variables meaningful names. There is no need to abbreviate variables and/or give them cryptical names, or you will just spell them wrong later. Use a naming system that makes sense to you. As I mentioned in my previous post, I avoid Hungarian notation, it just makes the variables hard to read. Since Lotusscript is a strongly typed language, the compiler is taking care of data types. I however do use some indicators for certain variables. For the few global variables I use, I do prefix them with g_, as I then can give local variables a similar name. By giving your variables meaningful names, the code also becomes largely self-documenting. Be consistent in how you name related variables. If you have a variable named startpos to indicate the beginning position of a string within another string, name the other variable endpos, not posend. Think through all variables you need so you give them good names. The variables posstart and posend are not as easy to read and understand as startpos and endpos. Of course, using CamelCase, posStart and posEnd are much easier to decypher. 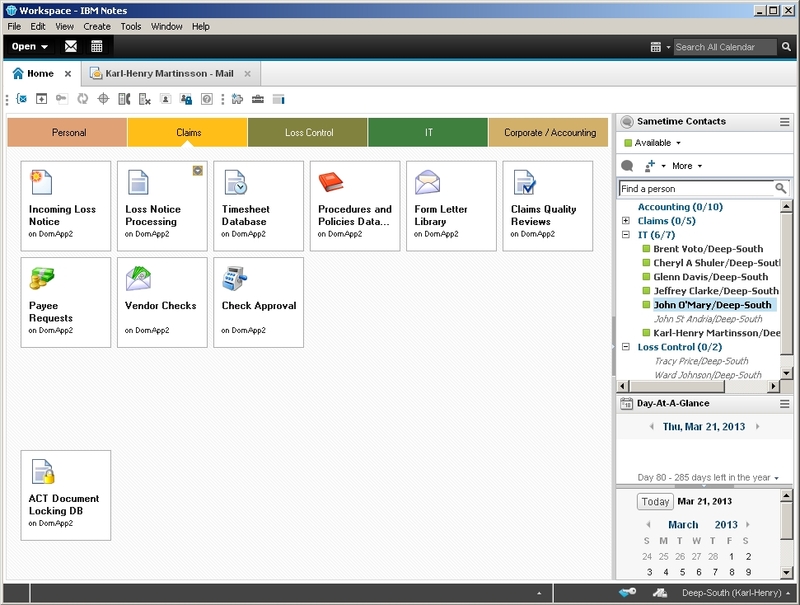 Use the same/similar naming convention for the Domino objects as IBM uses in the online help. Use ws, uidoc, session, db, doc, etc. If you need more than one object of any type, e.g. NotesDatabase, name them in a consistent way. I always use thisdb for the database the code is executing in, nabdb for names.nsf, archivedb for (you guessed it!) an archive database, etc. Declare the variables at the beginning of the code/subroutine/function. Don’t declare them throughout the code, this makes it much harder to find them later, when you perhaps need to see what data type they are. Declare the variables in a logical order. I always group the variables by type. First the UI classes, then backend classes, then any custom classes/data types, and finally other variables. Within each group, I declare them in the order I am using them. The benefit of this is that you get an idea of where to look for the variables in your function/subroutine. Use Option Declare. Yes, this needs to be repeated. Way too many (especially new) programmers forget this, or don’t know about this. As you can see, this function will do some kind of lookup in names.nsf and retrieve the name, phone number and employee number from the person document. It is then (probably) storing the values into the backend document of the currently open document. Just by declaring and naming variables in a logical way you can often figure out what the code will do further down. If you declare variables that you end up not using, remove them. Since you now are a good programmer who is using Option Declare, you can very easily test if a variable is used by commenting it out. If you don’t get an error, you can remove it. This brings us to the art of commenting. Yes, it is a little bit of an art, and I have seen way too much code written where the code is either overly commented (not very common), or hardly at all (very common). The art is to add just the right amount of comments. There is an old saying among programmers: “if the code was hard to write, it should be hard to read”. But it may not be another programmer that have to look at the code and find a bug in it or update it with new functionality, it may very well be you. 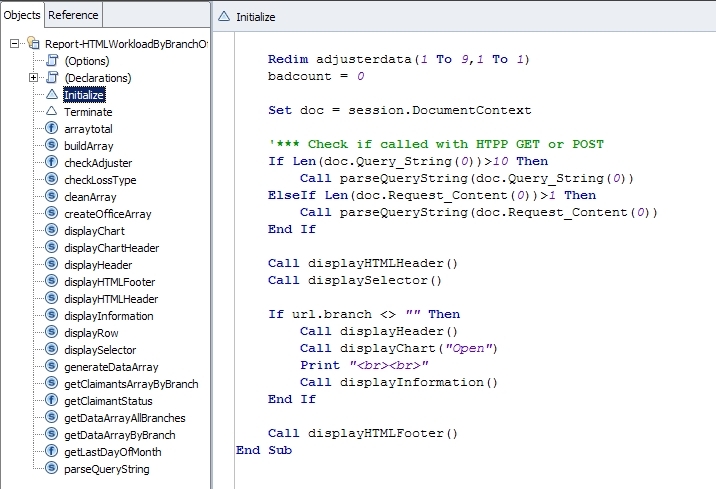 And if you have commented your code, you will not have to analyze every line of code, trying to figure out hwo you were thinking a few months or even years ago. '*** Get the email address from the field "InternetAddress"
This comment explains what we actually are attempting to do. In real life, you would probably break out this code into a separate function with a descriptive name. The example above is just for illustrative purposes. I will cover functions in a future article. Comments are crucial when you use some kind of work-around, or when your variables or field names have been named something that is not clear. I have cases where a field was initially named for the data it would hold, but later it was changed to something totally different. Make a note of that in your code. Or if you have to use some more or less obscure work-around to get the code to work, it would be very annoying if you (or another programmer) later removes that line. A typical example is to perform a db.FTSearch() with a query that will not return anything to get an empty document collection for later use. Comments explaining one line of code or a command are put on the same line, with no stars, just an apostrophe. Comments explaining a section of code are put on their own line, and I start them with three stars to make them more visible and make it clear they are comments and not code. Remember, comments are there to help you remember (or tell someone else) what is happening in the code. As you can see, variables are declared all over the place, some declared but never used, inconsistent named, and of course no comments. I think this code is much easier to follow, cleaner and easier to maintain. This is the kind of code I would like to see if I came in to update or modify an existing Notes application. Wouldn’t you? Update: Made some small changes and clarifications, and fixed some typos. The inspiration to this series of blog entries partially comes from looking at code posted in the developerWorks forums. Some of it is extremely hard to read and understand, even if you ignore the fact that the forum removes indentation from the code. If you write code that is hard to read, your applications will be hard to maintain. Write the code so it is easy for the poor person who will be maintaining the code in the future. Most probably that person will be you. You might also have to post your code in the developerWorks forum or on StackOverflow for help. If the code is hard to read and understand, you might not get very much help. What I will talk about is what you can do to become a better programmer, and write code easier to maintain. After being a Notes developer since 1996, I have learned a bit about what makes a Notes application easy to read and to maintain. I want to share some of my thoughts on this blog, or in the words of Kevin Spacey at Lotusphere 2011: “sending the elevator down”. Hopefully it will help someone. I will not talk to much about basic programming concepts or how to program in Domino Designer. I will assume that the reader already knows that, and is familiar with especially Lotusscript. I will also not talk much about how to create applications with a nice and easy-to-use user interface. That I will save for a later series of articles. Instead I will focus on things that I think will make you a better Notes programmer. I don’t take credit for coming up with all the ideas I will talk about, some are from attending sessions at Lotusphere in the past, and some were methods I picked up where I work or worked before. Many of the tips are almost defacto standards among Notes/Domino developers. In this first article, I will start with some tips for when you create forms. Use field names that makes sense, and don’t use cryptical field names. You may remember right now what kind of data the field is supposed to hold, but in a few months, you have no idea what is stored in it. Some developers use hungarian notation or some similar system with prefixes to indicate what is in a field, but in my experience that makes just for massive confusion later. The only prefixes I use on field names are dsp for any computed-for-display fields and flag for fields that are used to indicate if a document has been processed, is ready to be deleted or to decide if parts of the form should be hidden or not. If you use field names that indicates what kind of data types they contain, be consistent and at least use proper indicators. It is not a good idea to call a field txt_no1 if it contains a number. Anyone that sees that field name will assume it is a text field, and this will cause errors later on. Don’t copy fields and keep the automatically generated name. If you make two copies of the field Comment, you will have the fields Comment, Comment_1 and Comment_2. Rename the fields at once, before you save the form. If you save the form, the fields will be added to the UNK list, and will show up in different places, even if you never used them, and they are not present on any forms. My next suggestion is just something to think about, and it is actually more important when writing Lotusscript code. But since it impacts @Formula language, I am bringing it up together with the forms/fields. My suggestion is to consider using English field names, even if you are not a native English speaker. If you post code on forums like developerWorks — where the majority uses english — people will understand your code and thought process much better when the field names and variables are “self documenting”. However, I can understand that in some companies, you are told to use the native language for fields. In those cases, consider translating your code (field names and variables) before posting it. Test it to make sure you did not introduce any errors during the translation process. 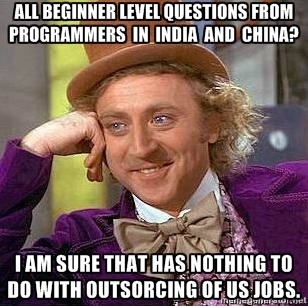 But if you can, use English as that is the universal language for programmers. When you hide text or fields on a form, use color coding and fonts to easily spot what is hidden and what’s not. I format everything that is always hidden in red, Arial 8pt. This makes it easy to see if red text is actually visible on the form, for example as an error message. Fields and text that is hidden to the normal user, but visible to certain users (e.g. database administrators), I often make blue. When it comes to hidden fields, I try to put them all in one section, usually at the top of the form. I do this as they often are used for computed fields further down, or to control hide-when sections of the form, and that is evaluated from the top of the form. In some places, I have a hidden field, followed by a computed-for-display field. I do this so the field can not be modified by the user, but it is modified by action buttons or other code using the UI classes. In those cases I put the hidden field first, then the computed-for-display field named the same but prefixed with dsp right after..
Below you can see a simple form from one of my production applications. 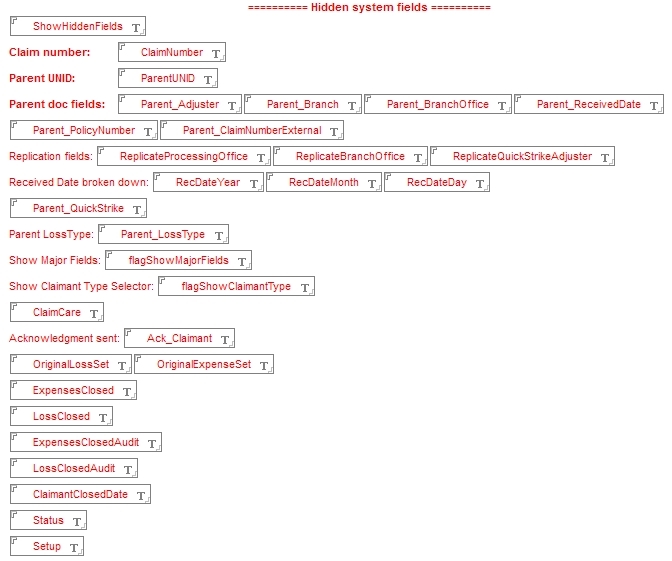 Simple form showing hidden fields in red and computed-for-display fields prefixed with dsp. With just a glance, you know what is hidden and not, and if any fields are display-only. You may wonder why I use computed-for-display fields instead of computed text. That is because if a user would forward a document via email, any computed text will be blanked out, while a computed-for-display field will show the value correctly. You also want to use descriptive labels, or even comments, to explain what the hidden fields are used for. You can also see that I try to make the hidden fields easy to read. Using tabs makes it very easy to line up the fields and labels. You will find that in the long run, this makes it much easier for you to read and understand your own forms later. Just as an example, below is another form where the hidden fields are all over the place, different format and some with labels/explanation, some without. Much harder to read, even if this is not an extreme example. Since the fields are logically named and grouped, it can work, but it is not pretty or optimal. It is much harder to read this, with different fonts, missing labels and fields all over the place. Imagine how hard it would be with crypic field names in addition to this! I also use red for hidden columns in views, again to make it obvious what is visible to the user and what is not. Normally I make even hidden columns wide enough to display the content, at least during the design phase. That is it for forms and views. In my next article, I will look closer at Lotusscript, and how you can make your code there easy to read and maintain.